The Salugpungan Ta’tanu Igkanugon Community Learning Center Inc. (STTICLCI) in Davao del Norte – a school borne out of the Lumad’s unity to defend their ancestral land – continues to struggle against militarization. MANILA – Teacher Mabel Historia, 22, has a diminutive frame with a slightly hunched back. She has had scoliosis since birth, but her physical condition doesn’t bother nor limit her. The military allegations about her were, however, a bit too much. “They said I am an NPA (New People’s Army) leader,” Historia smiles, slightly amused. “With my small frame, I can’t even carry heavy loads,” she said. The STTILC is located in the hinterland village of Palma Gil, in Talaingod, Davao del Norte. The area is home to the indigenous tribe of the Manobos, one of the Lumad tribes whose ancestral territories are in primary forests of the Pantaron Mountain Range. On March 3, the combined forces of soldiers of the 68th and 60th infantry battalions of the 1003rd brigade of the Philippine Army and the 4th Special Forces of the Armed Forces of the Philippines began to scour the area, entering the communities and conducting aerial bombings. “They disrupted our school graduation,” recalled Melvin Loyod, 18, and currently in grade 8. He said the program was halted as soldiers began streaming in. On March 20, bombs fell on Palm Gil. From March to April, the massive military operations forced the Talaingod Manobos to evacuate to Davao City, the second time in 20 years, where they stayed for a month. The soldiers left in late April, but returned in July in sitio Nasilaban. They remain encamped as of this writing. Historia, Loyod and the 12 other students of the grade 8 class joined the Manilakbayan ng Mindanao to call for the pull-out of the military in the communities. 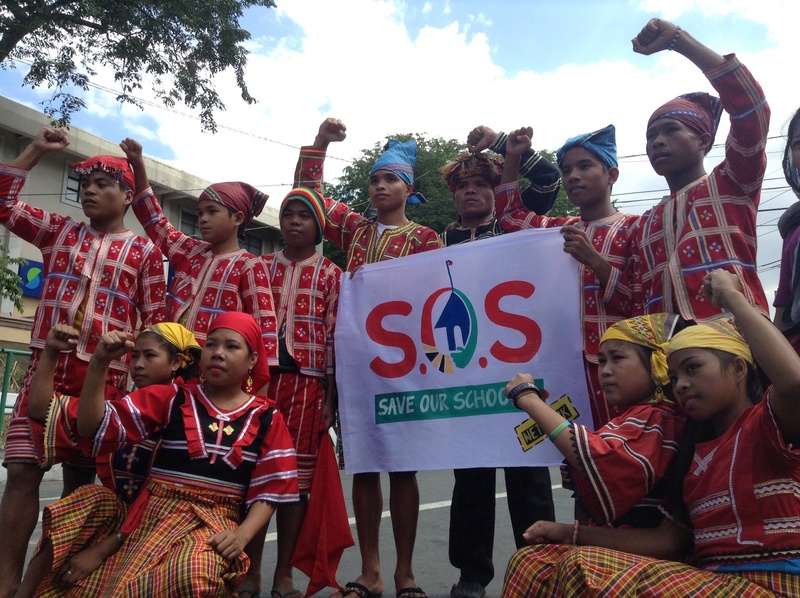 They have been performing and speaking in forums in Manila since mid-November as part of the Save Our Schools (SOS) campaign to gather support to protect schools from militarization. “Every day, soldiers go to the school. They try to turn the community against the school, to make the people drive the school out,” said Kerlan Fanagel, secretary general of the Confederation of Lumad Organizations in Southern Mindanao (Pasaka), and the STTICLCI research and curriculum development staff. It was built by, and named after the indigenous group Salugpungan Ta’tanu Igkanugon, which means “Unity of People to Defend the Ancestral Land” in Manobo. The group was formed on Nov. 30, 1994, uniting 83 Manobo tribes of Talaingod to defend the ancestral domain against encroachment of the logging company Alcantara and Sons (Alsons). The group, led by Datu Guibang Apoga, engaged in negotiations with the pro-logging Talaingod local government and the military. But as the militarization and the encroachment by logging and dam companies continued, the datus decided to launch a “pangayaw,” a tribal war to defend the ancestral land. Apoga and other tribal leaders were forced to go into hiding after government ordered their arrest in 1997, but the Salugpungan continued to unite the Lumad communities, gathering support for their calls. In 2003, Salugpungan sought the assistance of indigenous peoples’ advocates and the Rural Missionaries of the Philippines to set up STTICLCI, starting as a literacy-numeracy school for adult Lumads in Palma Gil village. In 2007, it was accredited by the Department of Education (DepEd) as an alternative learning school, and started teaching preschool to elementary. Its main school is in sitio Dulyan. Two years ago, it opened a boarding school that is the equivalent of a high school, and follows the K to 12 curriculum. The high school has two branches, one in sitio Nasilaban, Palma Gil, and in sitio Tibucag, Dagohoy village. “Our discussions take off from what we see around us,” she said. To start a science lesson on matter, for example, Historia would ask students to each bring an object from the surroundings, and describe the object’s features. Lessons in Music, Arts, Physical Education and Health (MAPEH) include Lumad culture and tradition. “The students themselves research about the traditional way of life, customs, and the history of their tribe,” Historia said. She added that the teachers, specially the non-Lumads, learn along with the students. Historia takes no credit for the polished performance of her 13 students during protests and forums. She said that they hold a cultural presentation every Friday, and students are divided into groups that prepare and present traditional songs and dances. This practice has honed the natural talents of the students, who are encouraged by the tribe to dance even as small children. Historia said the students also make the scripts and dialogue themselves. “In Social Studies, we discuss the national situation and issues,” she said. Their textbooks are those published by the thinktank Ibon Foundation. Before a history lesson, Historia asks the student to prepare a skit based on something they have experienced in the community. It helps them better understand the past by linking it to the present, and vice versa. Historia said the school would be offering training in agriculture, midwifery and education when students reach grade 12. The teacher lamented that the school direly lack supplementary educational materials. There is no computer class, nor access to the internet. Although there is one computer in the school, it is rarely used. There is no electricity in the village, and school generator is also scarcely used. The school also has only one microscope. Students Yanyan Salimdim, 17, Divina Pogkot, 16 and Melvin Loyod, 18 – all grade 8 students – all want to be a teacher someday. “I want to help my tribal brothers and sisters,” said Salimdim, in an interview with Bulatlat.com. Loyod said very few teachers are willing to work in an interior village like theirs. Pogkot, whose favourite subject is Math, said she wants to continue her studies and take up education in college. They said their parents cannot read nor write, and had wanted their children to finish school. The three students consider their boarding school special because they produce their own food. Mondays to Fridays are devoted to regular class work, but Fridays and Saturdays are field work, when they tend to their vegetable gardens. The students grow string beans, eggplants, squash and other vegetables. They also have a nursery where they raise fruit trees like marang and durian. The produce is enough to feed the total of 40 grade 7 and 8 students in sitio Nasilaban. They observe, and follow the movements of the elders in rituals, such as in giving thanks to the good spirits at the start of the planting season or the harvest festival. The three students said the presence of soldiers stirs fear among children and students. Pogkot said she worried for her parents and other adults. In 2011, her father Minggoy was accosted and detained by soldiers on his way to the farm. “They tied him up. They scattered the camote in his sack,” she said. Minggoy was held up by the soldiers from morning until 3 p.m., when he escaped. Pogkot said her family was so worried because he was missing for a whole day, and had not eaten anything. Loyod said soldiers harassed some grade 7 students. “The soldiers told them not to study there because it is an NPA school,” said Loyod. Some of the students were so scared they weren’t able to go to class. Fanagel said when the community returned in May after a month in evacuation, they found the schools ransacked and damaged. Plates, pots and kitchen utilities were thrown outside the windows. Books and notebooks were scattered. The electrical wirings in the high school in sitio Tibucag, Dagohoy village were all cut. The cables were newly-installed and were supposed to be powered by generator. The sacks of seeds for the students’ garden were hacked, and the spilled seeds were unusable. The ceilings of classrooms were also hacked. Camote plots and abaca crops were cut down and destroyed to clear a landing pad for helicopters. Houses were also looted, the residents’ bolos and other items missing. “When the classes started, we had a hard time,” Fanagel said. The community had barely recovered when the soldiers returned in July in sitio Nasilaban. The soldiers encamped in the DepEd school, positioned on a hill and just opposite the hill where the STTICLCI sits. The DepEd school had stopped classes because the teachers had left, said Loyod. Loyod said the soldiers get themselves drunk then fires in the direction of the boarding school. The Salugpungan went to Davao city to seek help from the DepEd, which facilitated a dialogue with the military on Nov.6. The soldiers agreed to move out of the DepEd school, but then, the next day, they moved into the community, which is on the vale between the two hills and even closer to the school. “We believe that aside from the school, the real target of the militarization is Pantaron Range,” said Fanagel. The Pantaron range straddles the Davao region up to North Cotabato and Bukidnon, and is the location of the headwaters of major Mindanao river systems. Its rich biodiversity of flora and fauna, remain well-preserved because of the active defense by the indigenous peoples of their ancestral territories. Fanagel said his group learned that the national government plans to build a P9 billion ($200 million) mining hi-way that leads up to Pantaron Range. He said that it means that the government is seriously aiming to get its hands on the resources of Pantaron range, thus, the persistent attack on the communities. Most recently, Loyod said soldiers are going around the community asking people to sign a document belying the statement of Salugpungan spokesperson Datu Duluman Dausay, who said that on Oct. 16, drunken soldiers encamped at the DepEd school fired in the direction of STTICLCI. “Those who refuse to sign will be considered an NPA supporter,” said Loyod. Also in October, state security forces arrested Dominiciano Muya, RMP staff and husband of STTICLCI executive director Lolit Muya, on criminal charges. He is still in detention in Bukidnon. Fanagel said the military-organized paramilitary group Alamara is also recruiting among Lumads, to divide their ranks. The indigenous peoples mandatory representatives (IPMR) in the local government bodies are being pitted against the progressive indigenous leaders. He cited the October 2014 issue of Raptor, the publication of the 103rd Brigade, which posted a “unified statement” of the IPMR which listed “communists,” including himself, school director Muya, North Cotabato indigenous woman leader Norma Capuyan, a bishop and several Talaingod leaders. The group also called for the immediate pull-out of military troops in Talaingod communities. “The militarization of our communities and the attacks on our services, specially our schools bring us closer to the spectre of Talaingod-Manobos being driven from their communities, fragmented and hopeless, more hungry than ever and Talaingod being opened to large-scale mining, the Pantaron being ravaged and the Alcantaras back in power,” said the group in its statement. “Amidst all the challenges we have proven over two decades that we can rely only on our own strength, to our unity as organization and as people. There is no reason now to stop our fight in seeking our rights and continuing the defense of ancestral domain,” said the Salugpungan statement. Continue your unity, from there you can draw your strength for victory.